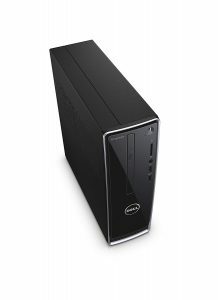 The Dell Inspiron i3252-10050BLK Mini Desktop is smaller, lightweight and built to impress. The design is well done and the polished surfaces will provide the luster to go hand in hand with your office or home monitor. The Dell Inspiron 3252 features a low voltage Pentium processor, 8GB RAM and plenty of space (1TB HDD) that’s all sufficient to power you through the day-to-day home and office tasks. It’s one caveat is a low powered power supply unit (PSU) which limits expansion, but that’s a problem mostly if you want to expand. Portability and space-saving have always been the general raison d’etre for thin and lightweight tablets, smartphones, and iPhone alike. Laptops have gained a lot of traction on their stationary desktop cousins especially on technology advancement and functionality. But there’s a new generation of PCs fighting to get back their place on both aspects of portability and space. We review the Dell Inspiron i3252-10050BLK Mini Desktop, a mundane choice, but one bound to change the landscape of space-saving PCs. Read on. Dell’s design is not less bright and vibrant as before. The chassis is made of black and sturdy aluminum with butter smooth plastic finish for the front face. The desktop edges curve softly and the edges have a bezel –like a ribbon running all around the corners. We were happy to note the design is no less modular than other Dell iterations we’ve seen. There’s easy access to the hood (not tool-less but still fine), plenty of peripherals like the keyboard and mouse that ship together and plenty of ports for connectivity. Most business and home systems come with Microsoft Windows 10 and hardware drivers pre-installed. Fortunately, we didn’t find any preloaded software or bloatware for that matter. The Windows 10 installation was clearly done to handle business tasks and web browsing. A small form factor (SFF) case means that it won’t take as much space on your desk. It measures 15 x 4 x 10.5 inches (8.7 pounds) meaning it will fit on most cubicles and open-workspace desks with ease. Compared to SkyTech ArchAngel GTX 1050Ti Desktop(20.2 x 8.5 x 18.2 inches) which reviewed recently, Dell is much slimmer and shorter. The Acer Spire TC-780-AMZKi5 Desktop (17.43 x 6.89 x 15.67 inches) and Acer Aspire TC-885-ACCFLi5O Desktop (13.78 x 6.42 x 13.39 inches) share almost similar hardware but are the new kids on the block bring better value. You need a wide array of ports to cover your mobile and monitor among other devices you need for your business and home use. There’s a wide array of ports to cover most devices, but of course, don’t expect the newfangled USB Type-C or Thunderbolt ports here. To start off, there are a few ports at the front: the power button, a 5-in-1 Multi-Card Reader, Audio combo jack, two USB 3.0 ports, and Optical drive. We were glad to find the USB 3.0 ports and card reader were conveniently located up front to help with access. The bottom section of the front panel is also home to the inlet-air vents. FYI, the Card reader supports SD, SDHC, SDXC, MMC and MMC+ formats. The rear sports the line in/out & mic, a single VGA connector, single HDMI connector, four (4) USB 2.0 ports, an Ethernet port, and the power supply port. The bottom section has two slots for expansion card should you need to go for it. Also worth mentioning is that the ventilation found its home at the rear too. The Dell Inspiron 3252 desktop features a Wi-Fi card (802.11b/g/n + Bluetooth 4.0 meaning you can browse the web wirelessly. There is a 1000Mbps RJ-45 connector if you prefer wired connections over wireless. The Inspiron is armed with a Quadcore Intel Pentium, 1.6 GHz N3700 processor with 2.4GHz during turbo boost. 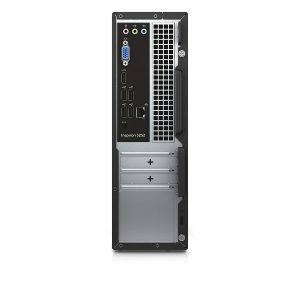 Although the processor is an entry-level Braswell architecture it is adequate for everyday tasks such as internet browsing and office applications. But that’s not to say it won’t struggle with demanding software. It has average CPU Mark of 1864 which is a little low, but that’s fine for a moderate use business PC. The processor works hand in hand with 8GB DDR3 SDRAM and 1TB of mechanical hard drive storage. 8 GB memory is sufficient for office and homework and it can handle multitasking pretty okay. Unfortunately, that’s the ceiling for expansion because there’s just a single SODIMM slot on the Dell Inspiron 3252 motherboard. This means you won’t be able to upgrade it further. 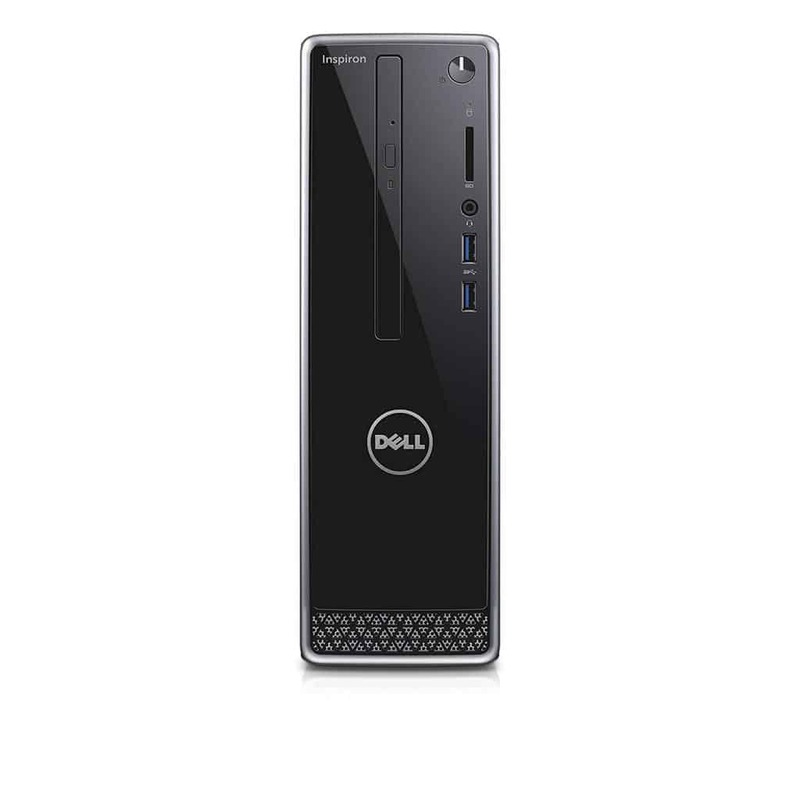 The Dell Inspiron i3252-7550BLK Desktop is a lower configuration of our reviewed unit that comes with 4GB memory size and a cheaper asking price. On the other hand, the 1TB storage is also plenty but SSD is faster and loads software and apps with bolt speed. If you’ve got extra cash and don’t need plenty of space, you could replace the HDD for an SSD to boost performance. Moving on, as far as graphics go, the Dell Inspiron 3252 desktop runs on integrated Integrated HD Graphics card (Braswell). This is a more power efficient and cooler working GPU that’s best for mainstream users looking for reliable performance on the budget. The highlight of this graphics unit is that it emits less heat output and uses less power. The whole desktop is powered by a 64-watt power supply which speaks volumes about our graphics card; its low energy powered. As a result gaming enthusiasts have no place here as this graphics card unit barely has the oomph to hold down recent gaming titles, and also the power supply unit is too low to support any upgrades. The Dell Inspiron i3252-10050BLK Mini Desktop does not have groundbreaking performance nor does it brag about being a gaming workhorse. Its power supply limits its gaming capabilities being that it’s too low to handle extra hardware, but that’s a non-issue if you don’t need lots of power. On the bright side, it has a decent low powered processor, 8 GB RAM, and 1TB storage which brushes shoulders with some other mainstream desktops such as the Lenovo IdeaCentre 300 desktop. We recommend it for casual users with the intention to use it for official business or home office work. It runs programs like Google Chrome, Mozilla, Ms. Office and Netflix like a charm and you won’t raise a finger against the asking price. Also, the Acer Spire TC-780-AMZKi5 Desktop and Acer Aspire TC-885-ACCFLi5O Desktop. The two are the new kids on the block and they offer better value for your money with more features.